In the previous post I suggested that one way of teaching people to become better thinkers is to teach them how to get better at dialogue. I argued (or rather I paraphrased Rupert Wegerif’s argument) that dialogic thinking skills are learned in dialogues with others and are transferable to different contexts. I have also argued that becoming good at dialogue is a profoundly import educational endpoint in its own right (see this post, for example). But becoming good at dialogue is harder than it might appear. Research by Neil Mercer, Rupert Wegerif and Lyn Dawes found that group talk in schools is often ineffective. Such ineffective talk can be categorised in two main ways: disputational talk (characterised by individuals egotistically trying to impose their views on others, perhaps to protect an identity defined in terms of their abilities relative to those of others) and cumulative talk (characterised by uncritical agreement in order to maintain group harmony, perhaps to protect an identity defined in terms of belonging to the group). We need to first define and then develop talk that is more dialogic, allowing us to steer a course safely between these two talk-types. The German philosopher Jürgen Habermas has argued for the need to create an ‘ideal speech situation‘ in which the outcomes of group talk are determined by the ‘unforced force’ of the better argument and not by coercion. To achieve such situations interlocutors must adhere to a set of basic ground-rules. But the idea of a single set of ground rules that define good dialogue in all contexts has been questioned; we engage in dialogue with embodied others for whom we need to show care and in a variety of contexts to which need to be sensitive. Perhaps then what we need is a framework that sets some parameters for good dialogue, but which is adaptable to different contexts. I think this framework might be provided by the ‘4Cs‘ used to support the quality of dialogue in Philosophy for Children (P4C). 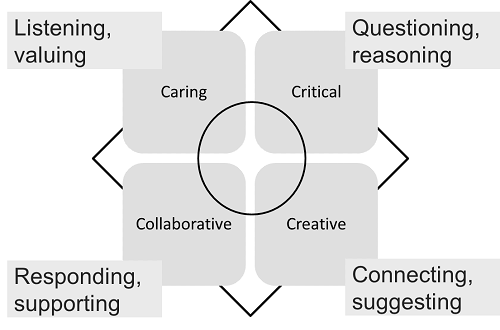 The idea here is that effective dialogue requires a harmonious balance of four inter-related ‘modes’ of thought, as illustrated below (this is a poor representation in that it shows boundaries around each of the 4Cs, where as in fact they are not so distinct). 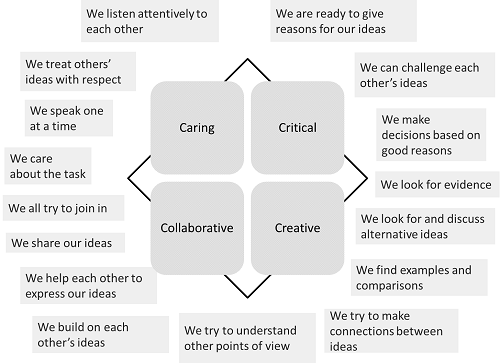 Three of these modes of thought (critical, creative and caring) were used by the American founder of P4C Matthew Lipman to define ‘excellent thinking’ or, if we consider dialogue with others to be ‘thinking together’, excellent dialogue. Lipman acknowledged the importance of critical thinking (which might involve questioning ideas and procedures, giving and demanding reasons and evidence and using these to make judgements), but he regarded it as only one of three equally important ‘dimensions’ of thought. The second dimension, creative thinking, is needed to generate fresh perspectives: to hypothesise and speculate, to find examples and comparisons and to make connections between thoughts that had seemed unrelated. But even a combination of critical and creative thought is ineffective in dialogue if there is no caring dimension to our thinking. Lipman used the term caring to cover diverse aspects of thinking such as appreciating, empathising and valuing emotions. Caring thinking might involve caring both for the quality of the dialogue and for our interlocutors; without such care it is unlikely that the outcome of the dialogue will be determined solely by the ‘unforced force of the better argument’. The fourth ‘C’ in the framework is collaborative thinking and was introduced by Roger Sutcliffe, a founder-member of Sapere in the UK. This makes explicit the need to not only adhere to social etiquette when thinking together with others but to genuinely respond to and build on their ideas and to support them to articulate their thinking. Balance is key here; if our dialogue lacks caring and collaborative elements then we may fall victim to the ‘Scylla of coercion’ or to ‘disputational talk’, while the absence of critical and creative thought will leave us circling in the ‘Charybdis’ of unreflective consensus or ‘cummulative talk’. Such rules are not fixed and final; different emphases may be placed on different rules in different contexts and the rules themselves will evolve with our experience and understanding of dialogue. it provides us with a framework for teaching dialogue. It is possible for teachers and groups of children (once they have an understanding of what the behaviours ‘look like’ in practice) to identify the behaviours they need to focus on to move the quality of their dialogue forward. In our book ‘Dialogic Education: Mastering core concepts through thinking together’, Rupert Wegerif and I offer some detailed ideas for working with children to establish a set of ground rules which provide a basis for reflection on the quality of dialogue and so act as a scaffold for progress. This allows us to teach for dialogue as we teach through dialogue. Below are a set of provisional ground rules for caring thinking developed by a group of nine and ten year-old pupils at The Wroxham School. 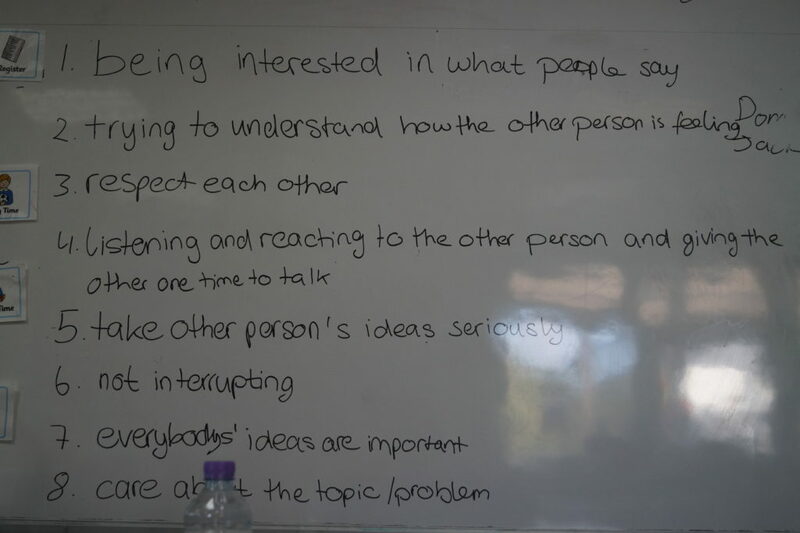 The class went on to prioritise a small number of these rules to focus on during talk-based activities in the subsequent weeks; they also defined similar rules for the other three modes of thought. The ground rules support the children to reflect on the quality of their dialogue and to set goals and develop strategies for its improvement. It is perhaps worth emphasising once more that ‘teaching for dialogue’ is not an alternative to teaching subject knowledge. Our book is about developing conceptual mastery within subjects and our argument is that dialogue is an important means of achieving this. Without dialogue children might not make meaning from their subject knowledge; without subject knowledge there can be no meaningful dialogue (a yin-yang relationship). Once new concepts are understood they become tools to think with; they shine a light into the vast darkness of human knowledge, enticing us on into the great adventure of education. For this and for wider reasons articulated elsewhere, I believe that drawing children into dialogues and teaching them to dialogue well is fundamental to education and is a way of introducing our children to the great and ongoing dialogue of humanity. Wegerif, R. (2004). Towards an account of teaching general thinking skills that is compatible with the assumptions of sociocultural theory. Theory and Research in Education, 2(2), 143-159.